The project objective is to improve the potential of ICT technologies and agronomic optimization, to prevent fungal diseases in crops of the vineyard. 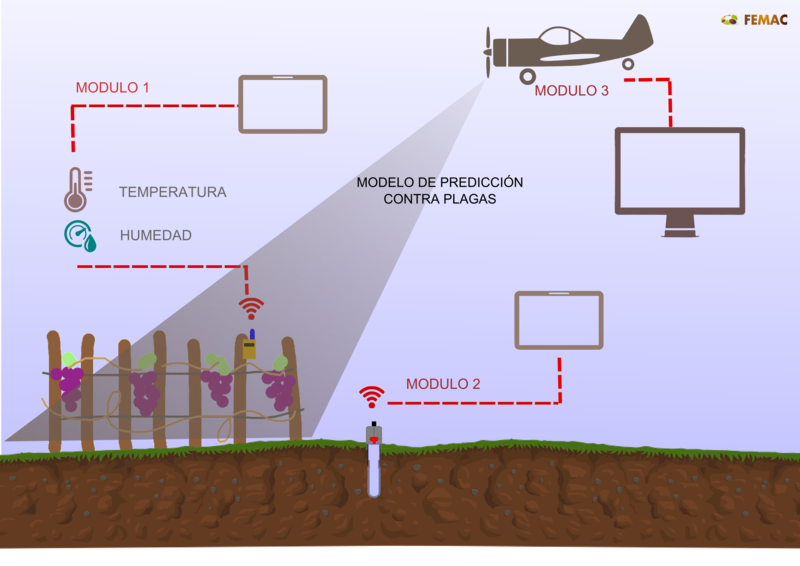 The project aims to develop a predictive model based on three fungal diseases sensing and remote sensing technologies, which were implemented in a pilot plant vineyard Raimat (Lleida), by a design field where two performances are compared against fungal disease control: conventional and eco-preventive treatment using temperature and humidity sensors located in the same vineyard at the leaf level, in addition to sensors for measuring nutrient levels located in the floor, and by shooting multispectral to know the rate of force (equivalent to LAI) within the same plot. 2.- Remote sensing technology based on aero trasnportada use aerial imagery systems and remote sensing technology: multispectral aerial photographs can be used for an accurate assessment of the cover vineyards, leading to optimize crops. Multispectral imaging can also be used to map and characterize the variability of soil. 3.- Wireless sensor networks (WSN – Wireless Sensor Networks) .